I was born with a one in a million anomaly that allowed my bowel to twist. With 7 major operations, somewhere under 30 minor ops, and enough radiation from scans to cook a ready meal (or two) under my belt; At the age of 21, its been a bit rough. The worst bit? Not eating for a year and a half! During that time the only way to get in touch with food, was to cook: I learned to cook so that when I could eat again I could eat well. 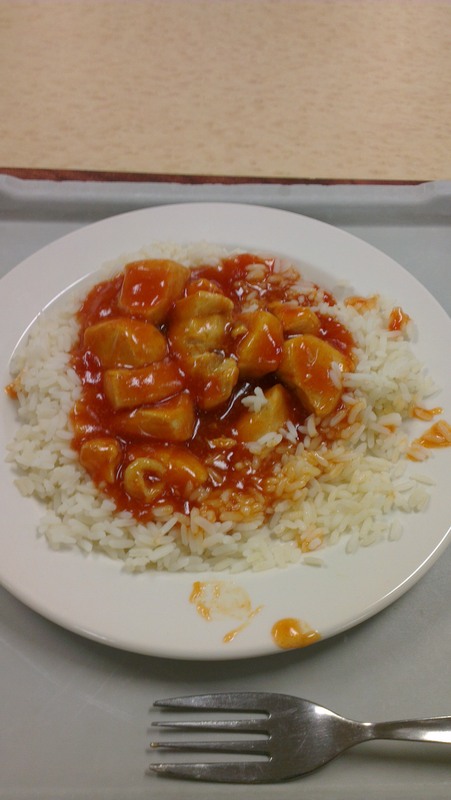 Hospital food is more Michelin wheels than stars in style The problems I’ll refer to in this blog centre largely around my a hospital stay at Southampton General University Hospital in 2013. 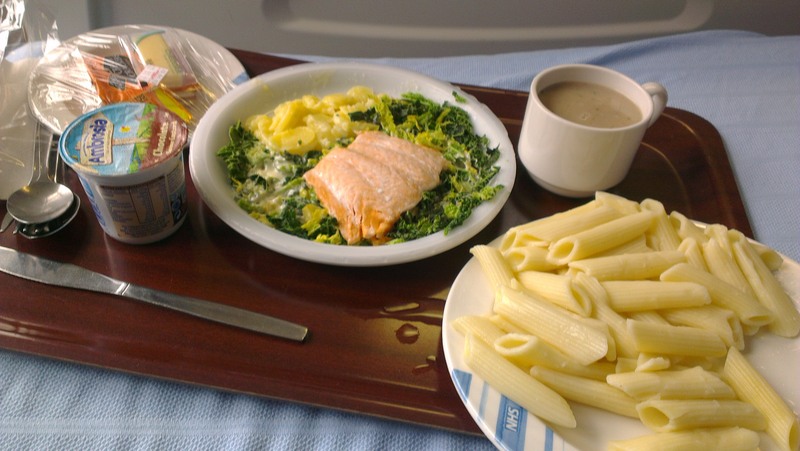 This food blog was for a University project but also call for a serious revival of Hospital Food, and Asks Doctor, Doctor, Feed Me Something Decent! Last time I wrote, I explained how going down to the staff and guest canteen, to pick up my food from the kitchen (and eat my food in a semi dining experience) had drastically improved Dinner time meals. Although the food was cooked fresh, and brought up in one swift move from the kitchen to me. There could be times where it sat waiting in the kitchen to be picked up for 15, 30 even 60 minutes. I’ll be honest, I can’t remember what exactly this is. Lamb I think. But it was Hot, tasted ok and the Mash was buttery. Can’t ask for much more on a hospital ward. I said to the staff, it was great we had resolved this issue. But that it would be nice we didn’t need to have this fight again (and again and again like the last time, and the time before that) So I seeked an email which confirmed plans to bring all Intestinal Failure Diet meals straight up after being served, with no time sat in the food warmer trolley. So perhaps she was misguided, misinformed or unable to share within the restrictions of her job. Either way its irrelevant. She worked really hard to change the food and improve it whilst I was there, and together we were successful. And if we can win once; We can win again. Make sure your Food is DECENT! Can I cook More with Less? 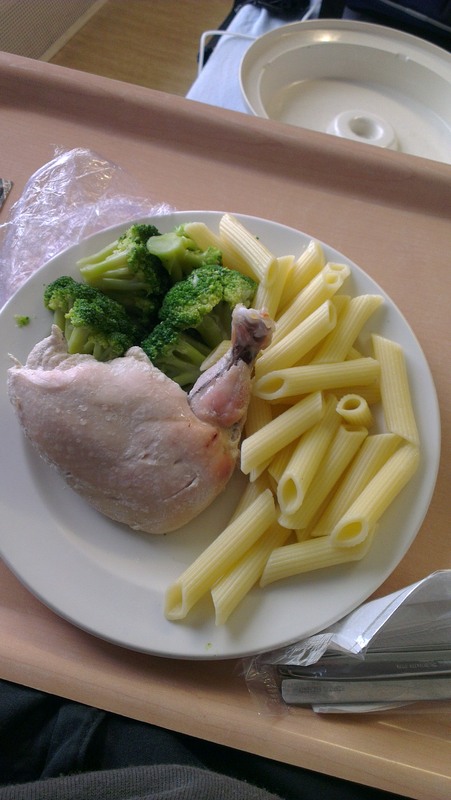 Submit your own Hospital Food Experiences too here! So we’re nearly at the end of my 3 week stay in hosptial. And its fair to say the food has drastically improved – But only when I go to the Kitchen to pick it up myself. And its not been without problems. 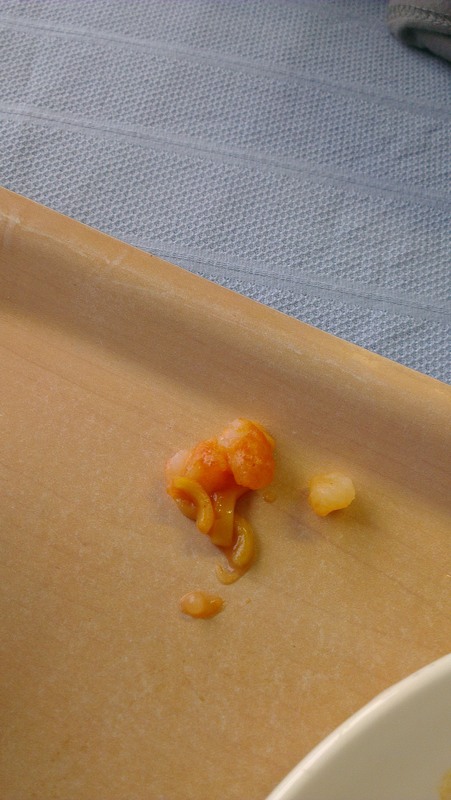 At one point I was served a Spaghetti Bolognaise that taste just fine, but the Spaghetti was in a slab. So I went back to the kitchen and asked the chef if he could do me some more. He more than obliged infact, he invited me into the kitchen to discuss my dietry needs. I even taught him the trick of rinsing pasta and rice after cooking to remove the bad sticky starch – A Revelation to him (Which I thought was a given on the back of all of all Pasta & Rice backs, but apperently not). Interestingly the ‘diet’ kitchen wasnt massively large but catered for 100 patients. So its clear the diet chef was a busy bee, but the fact he had time to re-make food when it wasn’t good enough shows there is no reason to rush. But Lunch time still hasn’t improved. Literally On the ward the food is awful, when I pick it up from the kitchen and come face to face with the chef the food is more than average at times enjoyable would you believe it. The choice from the staff canteen which changes everyday is refreshing too. Before I “leave” I’ll let you know what arrangements I get put in place so other patients can ‘potentially’ benefit and explore how easy it is to cook a decent meal with less equipment than the industrial ‘diet’ kitchen. Keep an eye on www.feedmesomethingdecent.co.uk! And if you have an experience: Submit it! Literally. Who’d have thought it would take me to walking into the kitchen to get my food, in hospital, to get a substantial HOT meal. Well Pictures in this case say more than words. It dumbfounds me how the food was not only hot, but looks appealing, nutritious and well presented. But that’s not quite the end of the story. I have about a week left and there are a few more revelations to come. 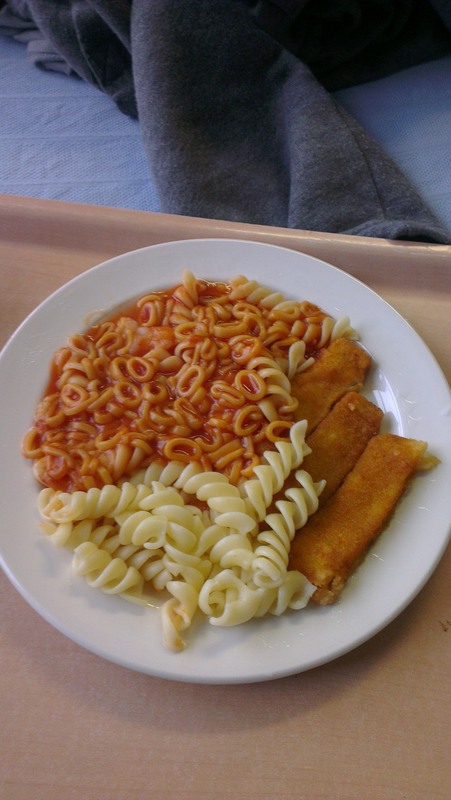 Check back after the weekend to see if I get the ever forgiving ‘Decent’ meal on the ward. Yum, literally last nights left over pasta (I recognize from seeing in the staff canteen the previous night) & spaghetti hoops with what I can only presume was bonus mash potato. So I reach my limit. There simply MUST be something they can do, or offer me thats better than this? No they keep saying. This is it. There are only so many times you can say the same thing to the dietician and ward staff. But I know there are other options. On my casual strolls around Southampton General I find the Spice of Life staff and visitor canteen. Its owned by the same company, medirest, and yes they serve steamplicity food. However, they also serve food hot. And the canteen, shares their kitchen space with the ‘Diet Bay’ where my IFD[foot]Intestinal Failure Diet[/foot] menu is cooked. So far the defence for my food being cold is, its brought up straight away. We can’t bring it up any faster – thats why its cold. (As if this is ok?) So I decide to take the initiative and as the old saying goes. If the Hot Potato won’t come to Jamie, Jamie will go to the Hot Potato. I arrange to go and pick my meals up from the kitchen – and remove the transport element. If they cant get hot food to me, i’ll just go pick up the hot food. See just how drastically this improves my food when I pick up my first evening meal directly from the chefs hands tomorrow. This Blog is re-creating my 3 Week stay in Hospital in Janurary when this picture was taken. 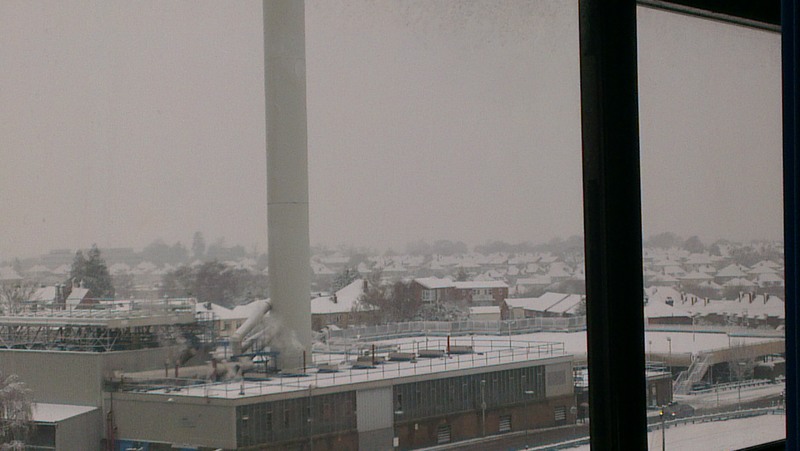 I was an in patient at the Southampton General, part of the University Southampton Trust. So we’re established, the food is pretty lame. The choice isn’t extensive. And I’ve rather exhausted the options I do have. Neither Quite a Bake, nor quite consistent. Neither were particularly hot either. As for the fact I’m yet to have a hot meal, I’m promised my Sweet and Sour Chicken I will receive that night will be hot and brought up straight away. A special effort is promised. I am elated, Hot food? Yum! But I explain, this is only a victory if it’s not a special effort but is made standard practice. Whats the chance that it will continue? But here is to victory number one, a Sweet (And Piping Hot) Victory. Sour to ensue on Monday. As the NHS Shuts down for the weekend, so will we. Where are the Weekend Staff? And if there was any left from dinner last night A Yogurt or piece of fruit. I’m supposed to be fueling myself with as many calories as possible and avoiding fibre which will rush through my bad tum. None of this screams out to fit the bill. I wont bore you with more posts about my breakfast. But after 3 weeks of peanut butter sandwiches at 8am in the morning as my only sustenance until lunch I can tell you – I was getting a bit nutty. Lets start with the Curry. Everyone out there knows that acidic tomato based meals (Think baked beans for the extreme of this) cause more gasses and bloating than others. So for someone with a tummy whose intestine has failed enough to put them on the Intestinal Failure diet, could do with avoiding any extra pain and uncomfort than what they suffer with anyway. So to order a Cream based Curry and be confronted with tomatoes causes more than a bit of heart burn. With the rest of the menu being things like Bolognaise & Shepard’s Pie, having a creamy curry should be some rest bite to the nasty acid. Alas. The Sausage & Mash? Not very exciting. True. But as my Dietician said how do you make this look exciting and appetising? Its not easy. False. This meal is exactly the same, Two Sausages and Mash. But the quality and appetizing appeal of it is massively different. Admittedly I hadn’t added my mug of gravy to the meal before I took the picture – but I’m sure you can agree why I didn’t jump straight it. The irony of the sausages I was provided was the poor quality of them too; My dietician was more than specific and explicit if you must eat processed meats like Sausages, make sure they are good quality, high in percentage of meat. The rusk and cereal in cheap sausages may cause you bloating. I can assure you – those sausages weren’t even of Little Chef breakfast style quality. Which brings me to my final meal, a plate of cold soggy (In a overtly plain white sauce) carbs. 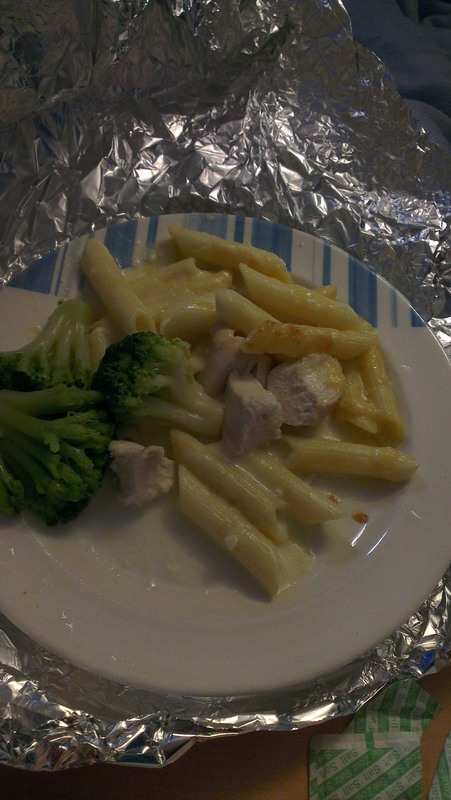 Pasta is usually a big safe meal for me, carbohydrates are easy for any tummy to break down. However this is only true when they are freshly cooked. When the starch in Carbohydrates is cooked, it changes making it easy to digest, but it then changes again when it cools and becomes difficult for any tummy to digest. This is the predominant reason for me being on the IFD menu, because I really struggle with re-heated and cold carbs. 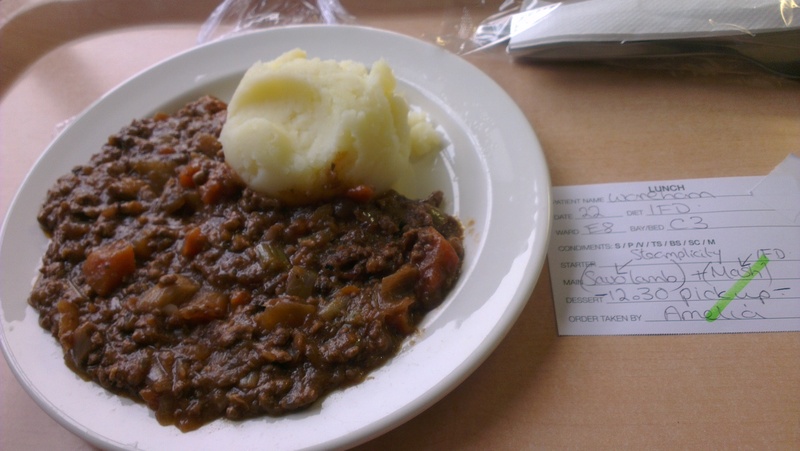 The normal menu Medirest provides people at Southampton has around 40 meal options, but all are created off site, frozen and nuked on the ward for consumption. All of my carbs in particular needed to be freshly cooked and delivered to me hot in order for me to be able to eat and not have to deal with painful trapped wind for the following hours. I’ve now been in four days, and I’m yet to be served a meal that is freshly hot or hasn’t been re-heated. The Dietician will be back tomorrow and I’ve kicked off to the ward staff who have arranged for someone from the kitchen to come see me too. Lets see if they can do anything to get me something hot?